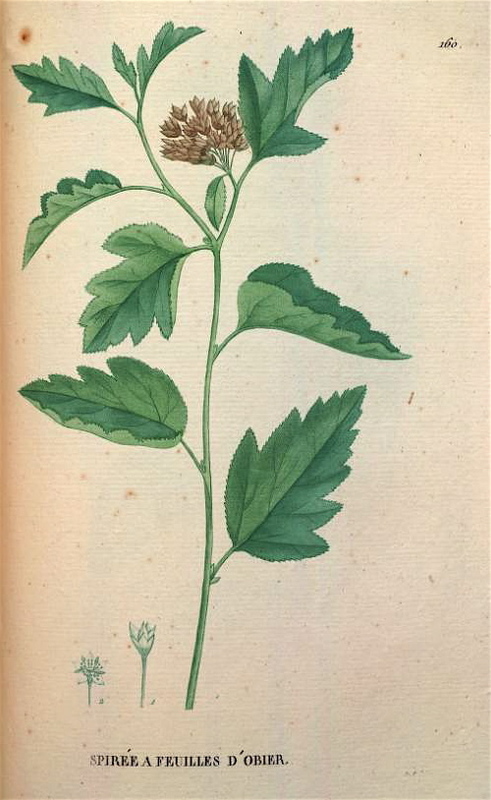 Hortus Camdenensis | Physocarpus opulifolius (L.) Maxim. Fully hardy, thicket-forming, suckering shrub with arching branches, ovate, 3-lobed, toothed leaves, to 8cm long, and dense corymbs, to 5cm across, of small cup-shaped, white, pink-tinged flowers in summer, followed by clusters of red fruit. To 3m. The variety luteus, also known as aureus, has bright yellow flowers. [RHSE, Hortus]. Introduced to Britain in 1690. [JD]. Saint-Hilaire Tr. pl.160/1825. Probably introduced about 1854 as it is included in a handwritten list in a copy of the 1850 catalogue held in the Mitchell Library, inscribed Wm. Macarthur, Dec. 23rd, 1854 [ML 635.9m]. It did not subsequently appear in the 1857 catalogue. More details about Physocarpus opulifolius (L.) Maxim. Neillia opulifolia Benth. & Hook.f.